Beebe Healthcare Recognizes Gerry Whitcomb with the December L.O.V.E. Beebe Healthcare is proud to recognize Jerry Whitcomb, a member of the Facilities team, as the December Living Our Values Every Day (L.O.V.E.) Letter Award recipient. Last year, a task force of Beebe Healthcare team members met over multiple months to examine exceptional patient experiences and create a system of values, which every team member pledges to follow. Beebe Healthcare team members have pledged to live these values every day. As a patient or visitor at Beebe, you may see these value statements posted. We invite you to help us be mindful of our values as we care for you and your family members. Whitcomb was nominated by Frank Molino, Security Manager, at Beebe. Molino recalled a time when Whitcomb went the extra mile for the facility to protect team members, patients, and visitors. Whitcomb showcased the Beebe values of doing what it takes to keep everyone safe. 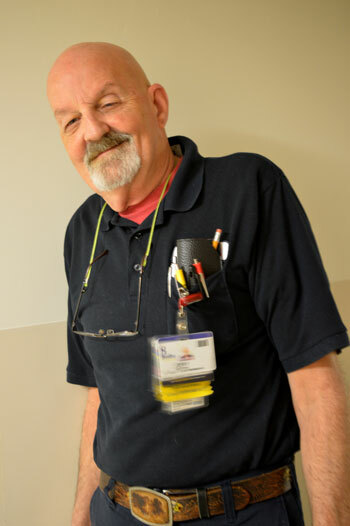 Whitcomb is well known around the medical center for his upbeat personality and his willingness to go above and beyond. During this year’s annual Toys for Tots toy drive Whitcomb again donated a brand new bike. It is his 19th year doing so. Thank you Jerry for all you do! Rick Schaffner, RN, Executive Vice President and COO of Beebe Healthcare, Catherine C. Halen, Vice President, Human Resources, and Angel Aguilar, Director of Facilities, were on hand to make the presentation and congratulate Whitcomb. For more information about Beebe Healthcare’s Values and how team members live our values every day, go to /our-values. For more information about Beebe’s “Celebrate Excellent Care” program and how you can support Beebe Healthcare, the local non-profit community healthcare system, contact the Foundation at (302) 644-2900.